Landcare NSW has announced that Deputy Chair, Stephanie Cameron, will become the organisation’s new Chairperson, in what marks a significant transition for the peak representative body of Landcare in NSW. Announced at the annual Trees in the House event in NSW Parliament House, Ms Cameron will succeed long-serving Chair Robert Dulhunty following the Landcare NSW AGM on Wednesday, 14 November 2018. The transition marks the end of nearly 30 years of volunteer service to Landcare for Mr Dulhunty, who was a founding member of Landcare NSW in 2007 and has served as Chair since 2012. Landcare NSW CEO, Dr Adrian Zammit, thanked Mr Dulhunty and congratulated him on his momentous contribution to the Landcare movement during his time with the organisation. “We warmly thank Rob for all that he has given to Landcare over a lifetime,” Dr Zammit said. “Rob’s vision and commitment to the Landcare movement is remarkable, and his experience and depth of knowledge of Landcare and broader natural resource management has seen him create a wonderful legacy for our organisation. “With over 60,000 active Landcarers, and 3000 groups working on numerous projects around the state, Landcare initiatives and stakeholders are many and varied. Rob’s ability to continually unify and draw together support from the corporate, government and philanthropic sectors has been outstanding, and has enabled Landcare NSW to become a truly representative organisation,” he said. Incoming Chair, Stephanie Cameron, is a qualified scientist who comes to the role having been actively involved with Landcare in the Tamworth and North West region for many years. Ms Cameron was a founding member of the Tamworth Urban Landcare Group, Treasurer of the Tamworth Regional Landcare Association and has served on the Executive Landcare NSW Committee since 2014. Speaking of her appointment, Ms Cameron said that she was honoured and excited by the opportunity to build on the work of her predecessor. “Rob leaves Landcare NSW having established a great platform for our future, and I look forward to working with all Landcarers as we continue our efforts to secure a future that is well funded, well recognised and well valued by all stakeholders,” Ms Cameron said. Reflecting on his tenure as Chair of Landcare NSW, Mr Dulhunty said that he was proud of Landcare’s achievements over many years, and he thanked all involved in the Landcare movement in New South Wales for their contributions. “Looking back on my time with Landcare, I’m very proud of what we have achieved in a relatively short space of time,” Mr Dulhunty said. 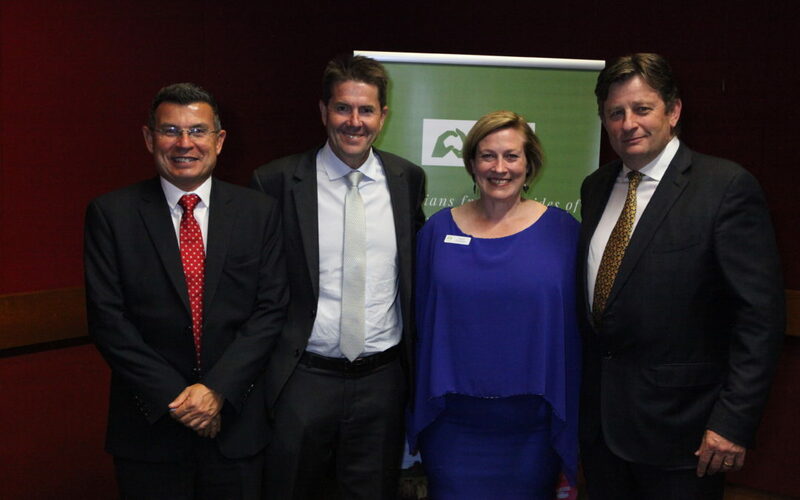 Co-hosted with the Parliamentary Friends of Landcare Group, Trees in the House is Landcare NSW’s annual flagship event. Attended by NSW Government Ministers, Agency representatives and local Landcare representatives from around the state, the event is the pre-eminent gathering of parties committed to advancing the environmental, social and economic benefits that sustainable land and water management are unlocking in NSW.